Water-resistant to help fight rust - permanently! 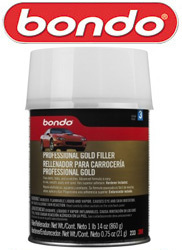 Bondo professional gold filler for automotive touch up jobs. It includes a cream hardener. This is the advanced formula which goes on easily and smoothly with minimal shrinkage.